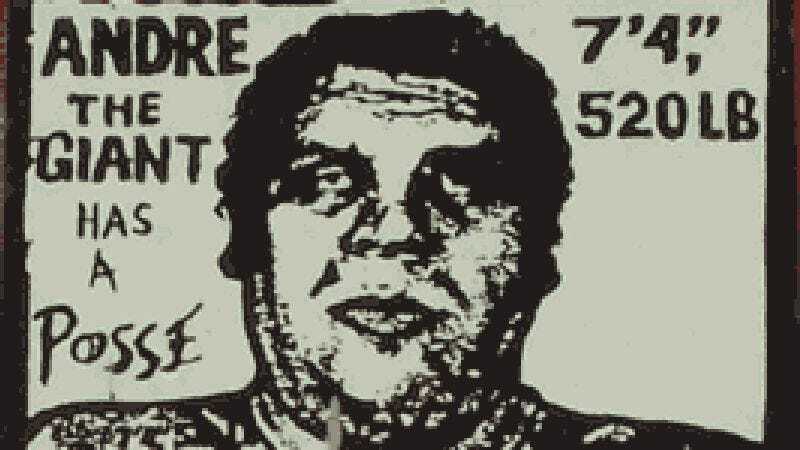 Shepard Fairey's "Andre The Giant" stencils were ubiquitous in 1990s New York. What it’s about: Some consider it art, some vandalism, and the truth is probably a little from column A, a little from column B. While modern-day graffiti is closely associated with big-city culture, it’s a tradition as ancient as writing itself. The result can be seen as an ugly sign of urban decay, or an inspiring example of art blooming in even the unlikeliest of places. Strangest fact: The word “graffiti” was originally used by archaeologists to describe words scratched into a surface, but eventually came to mean any kind of words or images that could be considered vandalism. But that original graffiti gives us a fascinating glimpse into ordinary people who didn’t build monuments that lasted through the ages. Political slogans, poetry, and declarations of love have ended up being preserved through the ages. The Safaitic language, which predates Arabic, is only known to modern scholars because of graffiti scratched into buildings in the desert that spans Syria, Jordan, and Saudi Arabia. Thing we were happiest to learn: The modern-day graffiti aesthetic was spread, in part, by PBS. In 1983, the network produced the documentary Style Wars, which introduced much of America to New York’s burgeoning hip-hop culture. The film covered multiple aspects of that culture—rapping, breakdancing, and graffiti, but the latter was the focus. New York’s extensive and often elaborate subway graffiti became an inspiration for street artists the world over. The film ended up winning the Grand Jury Prize at Sundance, and was re-released in theaters. Thing we were unhappiest to learn: Like everything else, graffiti has become commercialized. Countless ads have been spraypainted on walls and sidewalks over the years, imitating graffiti artists in practice, if not in spirit. In 2001, IBM was hit with a six-figure fine for spraypainting ads on sidewalks in Chicago and San Francisco. Sony took a lesson from that, and in 2005, had a graffiti campaign to support the PSP, in which they paid building owners for the right to deface their property with images of kids playing with their latest device, effectively turning those spaces into paid billboards. Also noteworthy: While graffiti has landed some artists in jail, it’s also been a ticket to the legitimate art scene for a lucky few. After Jean-Michel Basquiat, Keith Haring, and others moved from brick walls to galleries in the 1980s, a generation of street artists have gone mainstream. Banksy is arguably the most famous among them, and like most graffiti artists, he maintains a pseudonym to avoid run-ins with the law. Mathangi Arulpragasam was a well-known graffiti artist in London who began showing her often-political stencils and paintings in galleries before releasing albums under the name M.I.A. Best link to elsewhere on Wikipedia: One of the most pervasive and inexplicable tags in history is “Kilroy was here,” written all over America between the 1940s and ’50s, often with accompanying doodle (confusingly called Chad, not Kilroy), but most famously by GIs serving overseas during WWII. While no one was exactly sure who Kilroy was, his ubiquity seemed owed to… his ubiquity. “Kilroy was here” became a world-wide in-joke precisely because Kilroy was, in fact, everywhere. Soldiers often reported that whatever beach they had stormed, Kilroy had gotten there ahead of them. Kilroy even made it into Fort Knox, which was sealed from 1937 (possibly before the tag started appearing) until the ’70s. While Kilroy’s origins are unknown, one theory says that James J. Kilroy, a shipyard inspector, started writing his name on otherwise-inaccessible parts of ships, making Kilroy seem like he could go anywhere, a reputation that spread as more people began leaving Kilroy’s mark. Further down the wormhole: While scratching letters into a hard surface is tried and true, and paint and markers are the modern favorites, people have gotten creative with their tagging. Yarn bombing is the practice of knitting your own graffiti, wrapping yarn around signposts, trees, or statues, to give some life and color to drab public spaces.